Limited collection! 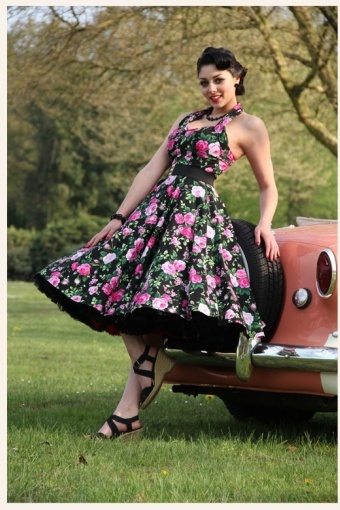 1950s reproduction Rosa Black swing dress. 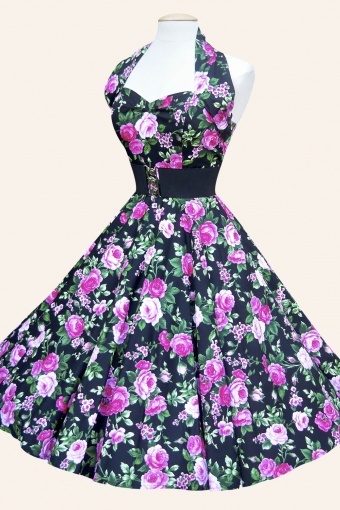 Nothing says 'fifties frock' quite like an authentic, vintage floral print. We are continually adding to our limited edition 'Floral' collection, making it understandably a favourite with our customers! These fresh, cotton Summer dresses feature our signature boned bodice and full circle skirt, making them a popular choice for weddings, parties, Summer picnics and festivals. Accessories (petticoats, belts, flowers) are NOT included, but are available to buy on the accessories page. We are totally committed to quality. Our polka dot retro circle dresses are made from 100% crisp cotton and easy-care cotton sateen fabrics, and everything is created in London. We have more styles & colours available!